• Removed code that reduced volume of subsequent notes if CC change received while MIDI note with low velocity playing. This a code bug in the original EPROM. 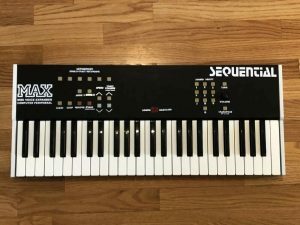 The original NON-Modded Sequential Circuits Max was designed as a companion to the Six-Track, Multi-Trak and possibly the C64 personal computer. It relied on MIDI messages for parameter changes, having no on-board way to vary them. It came with 80 “factory sounds” in EPROM, and storage for 20 more in RAM, which could be used after downloading via MIDI. Two “songs” or sequences could be recorded and either stored in RAM or dumped to MIDI. No battery back-up was provided for RAM, so all song data and the 20 programs were lost when the unit was powered down. Synth is in great working condition. Guaranteed to be operational. Returns accepted if Synth is not working as described.